Made to Measure Hardwood & Aluminium Bifold Doors. We design & manufacture all types of door system from multi-leaf bifold doors to patio doors. Here at Bifold Doors UK, we design and manufacture premium folding doors. Our doors are manufactured using premium hardwoods or lightweight aluminium. Folding doors are available in a wide range of different stacking/folding configurations, styles and BS / RAL colours. We offer a colour matching service to ensure your doors complement existing property styling. Our luxury aluminium folding doors range is manufactured here in the UK. We use high quality components to ensure solidity, durability and reliability. What’s more, our doors are secured by design locking systems for maximum security. The doors are 68mm thick and we provide a 28mm glass unit as well as a 68mm-wide sight line. Our doors also come with magnet stacking systems to prevent them having excessive free movement. Our doors use a top hung system with a range of bottom thresholds that can be up to 12 meters wide and three metres high. Our doors are available in any BS / RAL colours. We can provide door sets featuring trickle vents, with our master door leaf sporting a five-point locking system for added security. Standard glass spec is soft-coat Argon with a thermal spacer bar with thermal values of 1.2. Why Choose Bifold Doors UK? Our doors will complement your property. The quality of our products is unmatched thanks to our choice of materials & expert craftsmanship. Our doors don’t just look premium, they are premium to the touch. Excellent performance from effortless stacking through to good thermal characteristics & excellent longevity & durability. You can be sure with our range of folding doors that they’ll continue to perform like new. Whether you’re a property developer, renovator, architect, home builder or an individual, we can supply to trade. We supply to building companies, architects & home improvement consultants throughout the UK. To order your doors, you need to first enquire and provide your specific requirements. Our sales team will come back to you with a cost and additional information. Your order will then be processed, should you wish to go ahead. Depending on your location, we may be able to provide an installation service through our network of installers. Our systems are easy to install. If you require installation, please mention this in your enquiry. Our hardwood and aluminium bifold doors are suitable for DIY installation or can be installed by competent builders. Lead times will vary depending on your product order. Lead times are relatively short (15 – 40 days). If you have a priority order, please discuss this with a member of the sales team. Our door ordering service allows you to customise every aspect of your product, from size to colour and style. We offer an array of different hardware options, including hidden hinges / projection handles, custom glass options and more. Our sales team can advise and provide concepts of doors prior to accepting any quote. 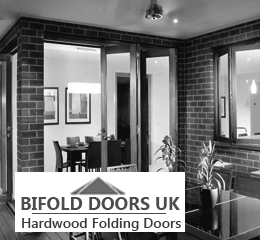 Why Order from Bifold Doors UK? We’re a UK-based manufacturer of folding door systems. If you want one good reason to buy from us, you can be sure of quality thanks to our established UK factory that manufactures all of the door systems. Bifold door systems – Bifold Doors UK can create doors of up to 12 metres in width, and three meters in height, meaning they fit even the largest of spaces. As well as offering several standard sizes, we can also create products in bespoke sizes. You’ll enjoy a wide choice of materials to suit your style and budget. Our door systems have been carefully designed for smooth operation and energy efficiency (1.2 uValue), with double glazing to keep in heat and keep out external noise/noise suppression. Design options – We offer a wide range of design options to help you get the look you want. Our bifold doors can be wood stained or painted before dispatch. Choose any RAL or BS colour. We finish our doors using high-quality paints from Dulux or Farrow & Ball. We can also add various ironmongery options, including a choice of handles to suit both contemporary and traditional homes. Exterior and Interior Bi-Folding Door Choices –Wooden sliding doors are becoming increasingly popular with many homeowners. One of the advantages of sliding doors themselves is the fact they take up far less space than doors that open outwards. What’s more, wooden doors are slowly losing any reputation of being less durable than uPVC and aluminium doors. They’re becoming even more liked for their luxury, sophisticated appeal and classic edge.Like our space-saving bi-folding doors, sliding doors are suitable for both interior and exterior use. All our wooden sliding doors are manufactured to the highest quality and can be made with varying glass panel configurations to provide varying aesthetics in your home. Our bifold doors can be manufactured from all types of wood, from oak to timber. They look great in traditional style homes, or in more contemporary materials such as aluminium. We can manufacture your doors in any RAL or BS colour, or paint them using Dulux or Farrow & Ball for a beautiful finish. Please note: we do not manufacture uPVC folding doors. Our style range includes concealed bifolding doors and slim-line folding door systems. Thanks to our strict quality and control environments, you can enjoy products that are designed to exceed quality expectations and products that are designed to last. Our hardwood products are treated and manufactured using high quality materials to ensure durability, long life and resistance against weathering, UV and high traffic. With doors starting at just £995, or £650 + VAT per door leaf, our bifold doors are competitively priced. The quote we give you will depend on factors such as the materials and extras you choose, but we guarantee it’ll be economical. The best way to get a price is to simply pick up the phone and chat to our team on 0843 886 8378. We offer several standard sized bifold doors, from six to 16-foot width. We can also create bespoke sizes to fit different spaces. Simply get in touch with our friendly team, and we’ll be happy to provide a competitive quote. Where Can You Use Bi Fold Doors? Not only are aluminium and oak bifold doors practical space savers, they can make a stylish addition to the decor as well. You can have them designed in complementary colours and materials to those found throughout your home. Conservatories or Orangeries – Wooden bifold doors, particularly double-leafed doors, work well when installed in the entrance of an orangery or conservatory. More glass panels in these doors allows even more sunlight into the main areas of your house through conservatory doors. Interior Rooms – Divide rooms and create space with easy-to-use interior bifolding doors. Some homeowners choose to have bi fold doors installed to divide space to create two rooms without having to extend a property and/or apply for planning permission.For example, you may choose to separate a lounge and dining space with glass bifolding doors, or turn a living room into part-lounge, part-home office. Wooden bifold doors with glass panels, for example, allow much more natural light into a room than a solid wall or a standard solid wooden door. They also make for a subtler entrance than hinged doors. Wardrobes – In bedrooms that are short on square footage, interior bi fold doors are both aesthetically pleasing and effective when installed for a walk-in wardrobe. Wooden sliding doors save a considerable amount of space in bedrooms and mean there’s less of an issue rising as a result of difficulties when aligning furniture with outwards opening doors, and so on. Storage – A wooden sliding door makes a great choice of door for a downstairs pantry, or even as the entrance to a toys and games room. The great thing about wooden sliding doors is the fact they can be made flush with the wall for an entrance that appears almost like a secret room or extra storage space. Energy Efficiency – Our wooden and aluminium bifold doors keep the heat in, making them ideal if you want to connect the garden with living space. You won’t have to worry about heat loss and expensive bills. Soundproofing – These doors are surprisingly robust, keeping noise levels to a minimum, even though they’re made with glass. Indoors, this can be a particular blessing in noisy households with young children. Perfect when you just want to keep an eye on playtime yet still enjoy some peace and quiet!Similarly, noise from the outside in the garden is quieter, allowing you to relax indoors, in peace. Security and Safety – Durable lock cylinders, double glazing – how else can people be sure the glass doors are safe? What about childproofing to prevent accidents? Space Savers – One of the main advantages of bifold doors versus the more traditional patio doors is that they allow so much more open space. Patio or French doors, on the other hand, can take up 50% of the surrounding space, whilst bifolding doors take up a mere 10%.Patio doors usually have rigid panes, and although you can open the double doors, you don’t really get the sense you’re sitting outdoors. Open up a bifold door, and any living space can feel like a garden room. You’ll have an abundance of natural light and fresh air! It’s amazing the difference they can make to a room. The large glass panes mean you can enjoy outdoor views no matter what the weather is like. Let in Natural Light – Make the most of views, enjoy your beautiful garden, and simply enjoy natural light as it streams into your home. Replacing an exterior wall with retracting doors means that even on days when the weather isn’t quite nice enough to sit outdoors, you can still enjoy plenty of natural light. Seamless Design Integration – There are numerous design finishes available. Whether you want to retrofit doors into a period property or install a bifolding system into a new contemporary build, there are numerous options. Rest assured, our doors work well as part of the overall aesthetic. With our bifold doors, prices start from £1,300 per (installation or door), with bespoke quotes available upon request. As the UK’s leading specialist in bifolding doors, we supply doors across London, the South East along with the rest of the UK. This also includes England, Wales, Scotland and Northern Ireland. We have short lead times and can offer fast dispatch if needed. We’re a part of the Country Hardwood Group, meaning we also manufacture Orangeries, Timber Orangeries, Conservatories, Roof Lanterns and Timber Windows. Looking for bifold doors and windows? Need other products to complement the overhaul of your living space? You’ll find it all under one umbrella in our one-stop-shop. Do you want to find out more about wooden sliding doors from Bi-fold Doors UK? Simply call today on 0843 886 8378 to get a free quote. Or click here to contact us for more information about our wooden sliding doors. We ordered a set of bifold doors for our Orangery. The doors opened up the front of the Orangery into the garden. We found the ordering process painless, the sales team explained the different options. In the end we went with a set of timber bi fold’s in a sea green pastel colour which complemented our Orangeries roof lantern and windows. The doors arrived and were premium in their look and feel. They were installed into the Orangery, the installation was quite straightforward. Very happy with the product, would highly recommend! If you’d like to discuss your project requirements with us, why not give us a call on 0843 886 8378? Durable and long lasting, our bi fold doors are engineered on the back of years of research and development. Our doors fold or slide away effortlessly and smoothly, giving that premium feel. Thanks to routered components, you can stack our doors into a slimmer space. This allows for a wider, more spaced out entry point into the home, conservatory or orangery. You can have doors designed and styled to fit your home’s existing style or design. Your door will be a perfect match and will blend in with its surroundings, standing out in style. We provide a whole host of door types, depending on your needs. Folding doors are dynamic, stacking to the left or right for up to 15 meters. Sliding doors eliminate the need for folding or stacking. However, the width they support may be more limited, depending on their use. We make all our products so they’re secure, robust and energy efficient so that more light and heat enter your property. Not only are our products strong, reliable and beautiful to look at, they’re great value for money. We can manufacture, supply and deliver doors nationwide. Please note: Lead times are dependent on the volume of doors, windows or products you require. We’re a part of the Country Hardwood Group. We also manufacture Orangeries, Timber Orangeries, Conservatories, Roof Lanterns and Timber Windows.